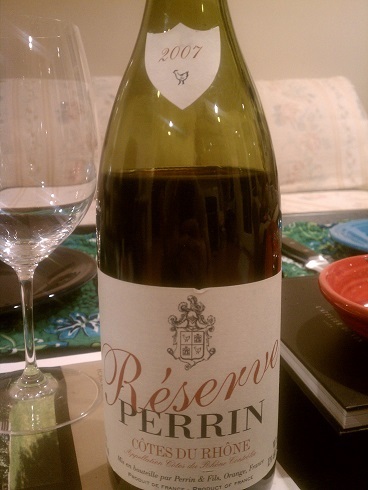 Moby and I grilled up some steak tips the other night and felt like having something special so pulled out this bottle of 2007 Perrin Reserve I’ve been saving for a few years. I can’t stress enough how fantastic a bottle this is for the price…absolutely outstanding. It’s not going to compete with a $100 bottle of Chateau de Beaucastel but for $10 you get a lot of the same qualities of a good bottle at a fraction of the price. This bottle showcased the 2007 vintage showing off the bold and upfront ripe fruit flavors. This is the perfect bottle to bring to a party and wow the guests. There probably aren’t too many bottles of 2007 kicking around but I’d lock up some 2010’s and save them for a rainy day as those are great buys as well. This entry was posted in Cotes du Rhone, France, Grenache, Mourvedre, Rhone, Syrah on July 21, 2013 by colonelgrape.